5.2 Monads in Combinatory Logic? 5.2.2 How to AOP with monads in Combinatory Logic? Although combinatory logic has precursors, it was Moses Schönfinkel who first explored combinatory logic as such. Later the work was continued by Haskell B. Curry. Combinatory logic was developed as a theory for the foundation of mathematics [Bun:NatICL], and it has relevance in linguistics too. To Dissect a Mockingbird and also Re: category theory <-> lambda calculus?, found on a Lambda the Ultimate site. The links to the To Dissect a Mockingbird site given by these pages seem to be broken, but I found a new one (so the link given here is correct). Of course combinatory logic has significance in the foundations of mathematics, or in functional programming, computer science. For example, see Chaitin's construction. It is interesting that it can be important also in some linguistical theories. See especially the theory of applicative universal grammar, it uses many important thoughts from combinatory logic. Lojban is an artificial language (and, unlike the more a posteriori Esperanto, it is rather of an a priori taste). It is a human language, capable of expressing everything. Its grammar uses (among others) things taken from mathematical logic, e.g. predicate-like structures. Although its does not make use combinatory logic directly (even, from a category logic / functional programming point of view, it uses also rather imperative ideas), but it may give hints and analogies, how combinatry logic can be useful in linguistics. Lot of interpreters at John's Lambda Calculus and Combinatory Logic Playground. CL++, a lazy-evaluating combinatory logic interpreter with some computer algebra service: e.g. it can reply the question with instead of a huge amount of parantheses and , combinators. Unfortunately I have not written it directly in English, so all documentations, source code and libraries are in Hungarian. I want to rewrite it using more advanced Haskell programming concepts (e.g. monads or attribute grammars) and directly in English. Records in function: in set theory and database theory, we regard functions as consisting of more elementary parts, records: a function can be regarded as the set of all its records. A record is a pair of a key and its value, and for functions we expect unicity (and sometimes stress this requirement by writing instead of ).Sometimes I think of as having a taste of record selection: selects a record determinated by key in function (as in a database), and returns the found record (i.e. corresponding key and value) contained in the container (continuation). Is this thought just a toy or can it be brought further? Does it explain why and can constitute a base? I think many thoughts from John Hughes' Why Functional Programming Matters can be applied to programming in Combinatory Logic. And almost all concepts used in the Haskell world (catamorphisms etc.) help us a lot here too. Combinatory logic is a powerful and concise programming language. I wonder how functional logic programming could be done by using the concepts of Illative combinatory logic, too. and Church numbers. I think, in generally, when defining datatypes in a continuation-passing way (e.g. Maybe or direct sum), then operations on so-defined datatypes often turn to be well-definable by some . Is this generalizable? I do not know. I know an analogy in the case of , , , . The notion of ordered pair mentioned above really enables us to deal with direct products. What about it dual concept? How to make direct sums in Combinatory Logic? And after we have implemented it, how can we see that it is really a dual concept of direct product? implemented in an analogous way. where both and have a common definition. Let us think of the variables as denoting head, denoting tail, denoting cons-continuation, and denoting nil-continuation. Of course we could use the two parameters in the opposite order, but I am not sure yet that it would provide a more easy way. hoping that this will enable us some interesting generalization in the future. But why we have not made a more brave generalization, and express monadic bind from monadic join and map? Later in the list monad, we shall see that it may be better to avoid this for sake of deforestation. Here a maybe similar problem will appear: the problem of superfluous . We should think of changing the architecture if we suspect that we could avoid and solve the problem with a more simple construct. Let us think of our list-operations as implementing monadic methods of the list monad. We can express this by definitions too, e.g. now we see it was worth of defining a common . But to tell the truth, it may be a trap. breaks a symmetry: we should always define the cons and nil part of the foldr construct on the same level, always together. Modularization should be pointed towards this direction, and not to run forward into the T-street of . Thus, we have defined monadic bind for lists. I shall call this the deforested bind for lists. Of course, we could define it another way too: by concat and map, which corresponds to defining monadic bind from monadic map and monadic join. But I think this way forces my CL-interpreter to manage temporary lists, so I gave rather the deforested definition. How to AOP with monads in Combinatory Logic? But separation of concerns by monads is more than having a bunch of special monads. It requires other possibilities too: e.g. being able to use monads generally, which can become any concrete mondads. David Madore's Quines (self-replicating programs) and Shin-Cheng Mu's many writings, including a Haskell quine give us wonderful insights on mathematical logic, programming, self-reference. Wikipedia's quine page and John Bethencourt's quine quine. See also the writings of Raymond Smullyan, Hofstadter, also his current research project on a self-watching cognitive architecture, Manfred Eigen and Ruthild Winkler: Laws of the Game / How the Principles of Nature Govern Chance, and Karl Sigmund's Games of Life, and Reflective programming (see Reflection '96 and P. Maes & D. Nardi: Meta-Level Architectures and Reflection). G.J. Chaitin especially his Understandable Papers on Incompleteness, especially The Unknowable (the book is available on this page, just roll the page bellow that big colored photos). The book begins with the limits of mathematics: Gödel's undecidable, Turing's uncompatiblity, Chaitin's randomness); but (or exactly that's why?) it ends with writing on the future and beuty of science. on The Tree of Knowledge (in Hungarian). To summarize this annotation by citing its main thought: The intelligence is not a mere map from the outer world: but it is a continuous world-creating, and there are as many worlds as many minds. Quines: the idea of self-replication can be conveyed by the concept of a program, which is able to print its own list. But pure -calculus and combinatory logic does not know any notion of printing! We should like the capture the essence of self-replication, without resorting to the imperative world. Let us introduce the concept of representing combinatory logic terms. How could we do that? For example, by binary trees. The leaves should represent the base combinators, and the branches mean application. And how to represent combintory logic terms -- in combinatory logic itself? The first thought could be, that it is not a problem. Each combinatory logic term could be represented by itself. Sometimes this idea works. The huge power of higher order functions is exactly in being able to treat datas programs and vice versa. Sometimes we are enabled to do things, which could be done in other languages only by carefully designing a representation, a specific language. The problem is that our program is simply unable to distinguish between CL terms which have the same normal form (in fact, equivalence cannot be defined generally either). If we represent CL terms by themselves, we simply loose a lot of information, including loosing any possibility to make distinctions between equivalent terms. We deal with combinatory logic expressions because our program has to teach them: it is related to it just like a vocabulary program is related to English. But we deal with programming logic expressions because our program is implemented in them. Just like VIM is related to C++. We said CL terms are eventually trees. Let us represent them with trees then -- now let us think of trees not as of term trees, but as datatypes which we must construct by hand, in a similar way as we defined Maybes, direct sums, direct products, lists. all CL expressions can be regarded as term trees. but CL expressions which can be revered as datatype trees must obey a huge amount of constraints: they may consist only of subexpressions , , , subexpressions in an approporiate way. 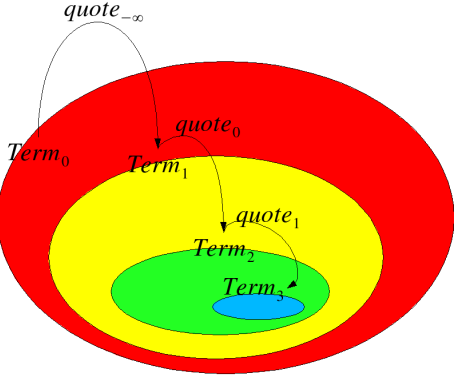 How do quotations relate to all CL expressions? In one direction, informally, we could say, quotations make a very proper subset of all CL expressions (attention: cardinality is the same!). Not every CL expressions are datatype trees. But the reverse is not true: all CL expressions can be quoted! Foreach CL expressionther is a (unique) CL expression who quotes it! We can define a quote function on the set of all CL expressions. But of it is an conceptually outside function, not a CL combinator itself! (that is why I do not typest it boldface. Is it an example of what Curry called epitheory?). After having solved the representation (quoting) problem, we can do many things. We can define meta-concepts, e.g. We can write our tutor program too. But let us discuss more clean and theoretical questions. So a quine is a program which is run, then rewrited as a quotation and so we get the representation of the original program. Of course the first three requirements can be contracted in two. Thus, a quine is a CL-term which is equivalent to its own representation (if we mean representation as treated here). We have seen that we can represent CL expressions in CL itself, which enables us to do some meta things (see the into of this section, especially Reflective programming, e.g. Reflection '96). The first idea could be: to implement CL in itself! The most important subtask to achieve this goal is to implement the algorithm of lazy evaluation. I confess I simply lack almost any knowledge on algorithms for implementing lazy evaluation. In my Haskell programs, when they must implement lazy evaluation, I use the following hand-made algorithm. Functions of increasing number of arguments pass the term tree to each other during analyzing it deaper and deaper. The functions are eval, apply, curry and lazy, but I renamed curry, because there is also a Prelude function (and a whole concept behind it) with the same name. So I chose Schönfinkel's name for naming the third function in this scheme -- it can be justified by the fact that Curry himself attributed the idea of currying to Moses Schönfinkel (but the idea is anticipated by Frege too). why not to write a lightweight library? (Lightweight in the sense as Parsec is lightweight in comparison to parser generators, or QuickCheck is lightweight). where Haskell can be a string, an appropriately designed abstract datatype, a rose tree or a Template Haskell term representation of Haskell expressions, thus any way used in Haskell metaprogramming (in the picture below, does it correspond to ?). So, the latter can contain the former, but what are the new advantages? where type Definitions = Map Definiendum Term. So we can get compiler algebra and other useful services in a modular way. Of course also an interpreter can yield useful services, but as the user interface grows, it develops to have a command language, which is in most cases imperative having less gluing possibilities than being able to use Haskell itself by this lightweight approach. In fact, it the was the quines (mentioned above) that forced me to think of a lightweight CL library instead of an interpreter. Writing a CL quine (in the way I can do) requires a lot of : quoting CL terms in CL itself. But quoting CL cannot be done in CL (only : quoting-the-quotation-of-CL-further can be done in CL), so my CL quine plans needed a lot of work quoting CL terms by hand. A lightweight CL library could do this job by using the power of Haskell (quoting CL terms can be done in Haskell, or more generally said: in the ultimate implementating language of this CL-project). combinatory logic, its terms being represented by Haskell binary tree abstract datatype. combinatory logic, its terms being represented by combinatory logic binary tree abstract datatype. We have already seen that we can define lists in combinatory logic by catamorhisms, so we can define binary trees too. And we can represent the base combinators by booleans which can be defined too in CL. So we can quote each CL term in CL itself. Henk Barendregt, Martin Bunder, Wil Dekkers: Systems of Illative Combinatory Logic complete for first-order propositional and predicate calculus. My dream is making something in Illative Combinatory Logic. Maybe it could be theoretical base for a functional logic language? [Bun:NatICL] Martin W. Bunder: The naturalness of Illative Combinatory Logic as a Basis for Mathematics, see in Dedicated to H.B.Curry on the occasion of his 80th birthday. This page was last modified on 15 July 2011, at 00:32.